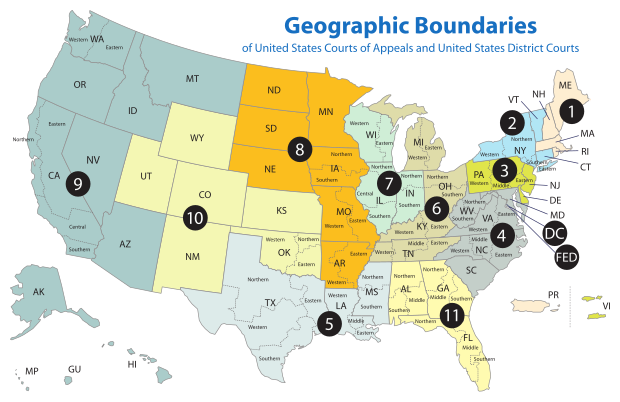 While it has the smallest geographic jurisdiction of any of the United States courts of appeals, the D.C. Circuit, with eleven active judgeships, is arguably the most important inferior appellate court. The court is given the responsibility of directly reviewing the decisions and rulemaking of many federal independent agencies of the United States government based in the national capital, often without prior hearing by a district court. Aside from the agencies whose statutes explicitly direct review by the D.C. Circuit, the court typically hears cases from other agencies under the more general jurisdiction granted to the Courts of Appeals under the Administrative Procedure Act. Given the broad areas over which federal agencies have power, this often gives the judges of the D.C. Circuit a central role in affecting national U.S. policy and law. Because of this, the D.C. Circuit is often referred to as the second-most powerful court in the United States, second only to the Supreme Court. A judgeship on the D.C. Circuit is often thought of as a stepping-stone for appointment to the Supreme Court. As of October 2018, four of the nine justices on the Supreme Court are alumni of the D.C. Circuit: Chief Justice John Roberts and Associate Justices Clarence Thomas, Ruth Bader Ginsburg, and Brett Kavanaugh. Associate Justice Elena Kagan was nominated by President Bill Clinton to the same seat that Roberts would later fill, but was never given a vote in the Senate. In addition, Chief Justices Fred M. Vinson and Warren Burger, as well as Associate Justices Wiley Blount Rutledge and Antonin Scalia, served on the D.C. Circuit before their elevations to the Supreme Court. In 1987, President Ronald Reagan put forth two failed nominees from the D.C. Circuit: former Judge Robert Bork, who was rejected by the Senate, and former (2001–2008) Chief Judge Douglas H. Ginsburg (no relation to Ruth Bader Ginsburg), who withdrew his nomination after it became known that he had used marijuana as a college student and professor in the 1960s and 1970s. Likewise, in 2016 President Barack Obama nominated Merrick Garland from the D.C. Circuit to replace the late Scalia, but the Senate controversially did not give Garland a full vote. Because the D.C. Circuit does not represent any state, confirmation of nominees can be procedurally and practically easier than for nominees to the Courts of Appeals for the other geographical districts, as home-state senators have historically been able to hold up confirmation through the "blue slip" process. However, in recent years, several nominees to the D.C. Circuit were stalled and some were ultimately not confirmed because senators claimed that the court had become larger than necessary to handle its caseload. The court has a history of reversing the Federal Communications Commission's major policy actions. Decisions of the U.S. Courts of Appeals are published in the Federal Reporter, an unofficial reporter from Thomson Reuters. John Roberts joined the United States Court of Appeals for the District of Columbia Circuit in 2003, succeeding James L. Buckley. The following are opinions written by Judge Roberts in 2003. John Roberts served his first and only full year on the United States Court of Appeals for the District of Columbia Circuit in 2004. The following are opinions written by Judge Roberts in 2004. John Roberts served his third and final year on the United States Court of Appeals for the District of Columbia Circuit in 2005. He was nominated to the Supreme Court of the United States by President George W. Bush originally on July 19 for the seat being vacated by Justice Sandra Day O'Connor's retirement and later nominated on September 5 to be Chief Justice of the United States after William Rehnquist's death two days prior. He was confirmed by the United States Senate on September 29 and left the circuit bench. He was succeeded on the D.C. Circuit by Patricia Millett. The following are opinions written by Judge Roberts in 2005. Arthur Raymond Randolph (born November 1, 1943) is a Senior United States Circuit Judge of the United States Court of Appeals for the District of Columbia Circuit. He was appointed to the Court in 1990 and assumed senior status on November 1, 2008. American Public Health Association v. Butz (APHA v. Butz), 511 F.2d 331 (D.C. Cir. 1974) was a United States Court of Appeals for the District of Columbia Circuit case argued on January 22, 1974, and decided on December 19, 1974. Garza v. Hargan (Azar v. Garza after Alex Azar's confirmation as United States Secretary of Health and Human Services) is a case before the United States Court of Appeals for the District of Columbia Circuit regarding a juvenile undocumented immigrant in the custody of U.S. Immigration and Customs Enforcement who seeks to have an abortion. Bancoult v. McNamara, 445 F.3d 427 (D.C. Cir. 2006), was a legal case in which Olivier Bancoult sued Robert McNamara, the former United States Secretary of Defense, challenging the removal of Chagosians from Diego Garcia when the United States of America built a military base in the British Indian Ocean Territory. The Court of Appeals for the District of Columbia Circuit ruled that the case raised nonjusticiable political questions and dismissed the case. Colorado River Indian Tribes v. National Indian Gaming Commission, 05-5402 (D.C. Cir. 2006), was a decision of the United States Court of Appeals for the District of Columbia Circuit that was handed down on October 20, 2006. David Lionel Bazelon (September 3, 1909 – February 19, 1993) was a United States Circuit Judge of the United States Court of Appeals for the District of Columbia Circuit. Derek S. Lyons is an American political advisor serving as White House Staff Secretary in the administration of U.S. President Donald Trump. Douglas Howard Ginsburg (born May 25, 1946) is an American jurist and academic who serves as a judge on the United States Court of Appeals for the District of Columbia Circuit. He was appointed to that court at age 40 in October 1986 by President Ronald Reagan, and served as its chief judge from July 2001 until February 2008. Ginsburg was nominated by Reagan to fill a U.S. Supreme Court vacancy after the retirement of Lewis F. Powell in October 1987, but soon withdrew from consideration after his earlier marijuana use created controversy.Ginsburg took senior status at age 65 in October 2011, and joined the faculty of New York University School of Law in January 2012. In 2013, he left NYU and began teaching at George Mason University's Scalia Law School. He is the author of numerous scholarly works on antitrust and constitutional law. Parhat v. Gates, 532 F.3d 834 (D.C. Cir. 2008), was a case involving a petition for review under the Detainee Treatment Act of 2005 filed on behalf of Huzaifa Parhat, and sixteen other Uyghur detainees held in extrajudicial detention in the United States Guantanamo Bay detention camps, in Cuba. The Special Division is a division of the United States Court of Appeals for the District of Columbia Circuit. 28 U.S.C. § 49 (1982 ed., Supp. V) (Title VI of the Ethics in Government Act). It consists of three circuit court judges or justices appointed by the Chief Justice of the United States. One of the judges must be a judge of the DC Circuit, and no two of the judges may be named to the Special Division from a particular court. The judges are appointed for 2-year terms, with any vacancy being filled only for the remainder of the 2-year period. Its constitutionality was upheld in Morrison v. Olson. On December 19, 1986, Lawrence Walsh was appointed Independent Counsel for Iran/Contra Matters by the Special Division. Spottswood William Robinson III (July 26, 1916 – October 11, 1998) was an American educator, civil rights attorney, and a United States Circuit Judge of the United States Court of Appeals for the District of Columbia Circuit after previously serving as a United States District Judge of the United States District Court for the District of Columbia. Stephen Fain Williams (born September 23, 1936) is a Senior United States Circuit Judge of the United States Court of Appeals for the District of Columbia Circuit. Wilbur Kingsbury Miller (October 9, 1892 – January 24, 1976) was a United States Circuit Judge of the United States Court of Appeals for the District of Columbia Circuit. Williams v. Walker-Thomas Furniture Co., 350 F.2d 445 (D.C. Cir. 1965), was a court opinion, written by Judge J. Skelly Wright, that had a definitive discussion of unconscionability as a defense to enforcement of contracts in American contract law. As a staple of first-year law school contract law courses, it has been briefed extensively.It flows from interpretation of the Uniform Commercial Code § 2-302 (1954) and is relevant for the Restatement (Second) of Contracts § 208.